Stephen Curry gave credit to the Sacramento Kings for a stunt they pulled during player introductions when they hosted the Golden State Warriors on Friday. The Kings took a jab at the Golden State guard for his recent moon landing comments by playing an old clip of an astronaut walking on the moon on the large video screens inside Golden 1 Center. They also played "Zoom, Zoom, Zoom, We're Going to the Moon," by The Kiboomers through the speakers. When asked about the video after the game, Curry thought the Kings pulled off the joke well. "That caught me off guard," Curry told reporters. "That was solid. ... A for effort, for sure." 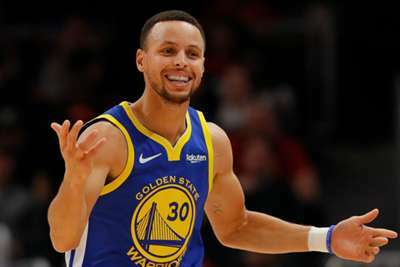 Curry's original comments came when he said during a recent appearance on the "Winging It" podcast he did not necessarily believe astronauts had landed on the moon, which prompted an invitation from NASA to its facility in Houston. Curry, however, told ESPN he was not being serious when he made those comments. Curry had a strong night against the Kings, scoring 35 points on 11-of-23 shooting in the Warriors' 130-125 victory. The Warriors improved to 20-10, while the Kings fell to 15-13.